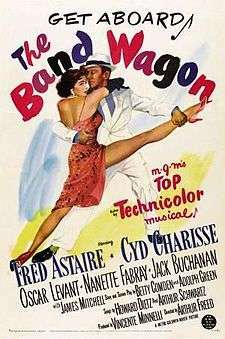 The Band Wagon is a 1953 musical comedy film directed by Vincente Minnelli, starring Fred Astaire and Cyd Charisse. It tells the story of an aging musical star who hopes a Broadway show will restart his career. However, the play's director wants to make it a pretentious retelling of Faust, and brings in a prima ballerina who clashes with the star. Along with Singin' in the Rain, it is regarded as one of the finest of the Metro-Goldwyn-Mayer musicals, although it was only a modest box-office success on first release. The songs were written by the team of composer Arthur Schwartz and lyricist Howard Dietz. (Schwartz was a prolific Hollywood composer who teamed with numerous lyricists over the years, while Dietz, a studio publicist, generally collaborated with Schwartz.) Some of the songs in the film had been created for the original 1931 Broadway musical by Schwartz and Dietz which was also called The Band Wagon, with a book by George S. Kaufman and starring Fred Astaire and his sister Adele. (Fred Astaire also stars in the movie.) The movie's dances and musical numbers were staged by Michael Kidd. Stage and screen star Tony Hunter, a veteran of musical comedy, is concerned that his career might be in decline. His good friends Lester and Lily Marton have written a stage show that they believe is perfect for his comeback. Tony signs up, despite misgivings after the pretentious director, Jeffrey Cordova, changes the light comedy into a dark reinterpretation of the Faust legend, with himself as the Devil and Tony as the Faust character. Tony also feels intimidated by the youth, beauty, and classical background of his female co-star, noted ballerina Gabrielle "Gaby" Gerard. Unbeknownst to him, she is just as insecure in his presence, awed by his long stardom. Eventually, it all proves too much for Tony. He walks out, but Gaby speaks with him alone and they work out their differences. They also begin to fall in love, though she already has a commitment to the show's choreographer Paul Byrd. When the first out-of-town tryout in New Haven proves to be a disaster, Tony persuades Jeffrey to let him convert the production back into what the Martons had originally envisioned. Tony takes charge of the production, taking the show on tour to perfect the new lighthearted musical numbers. Since the original backers have walked out, Tony finances it by selling his personal art collection. Byrd walks out, but Gaby remains. The revised show proves to be a hit on its Broadway opening. Afterwards, Gaby and Tony confess their love for each other. One musical number shot for the film, but dropped from the final release, was a seductive dance routine featuring Charisse performing "Two-Faced Woman". As with the other Charisse songs, her singing was dubbed by India Adams. Adams' recording of the song was reused for Torch Song for a musical number featuring Joan Crawford. The retrospective That's Entertainment! III released the Charisse version to the public for the first time. This footage was also included with the most recent DVD release of The Band Wagon itself. In the Variety review of the musical Bob Verini wrote: "There's no reason this reconstituted "Band Wagon" can't soar once it jettisons its extraneous and self-contradictory elements. But "Dancing" is some distance from finding its footing, despite finale's admonition to "Admit we're a hit and we'll go on from there." Not yet." Michael Jackson in his music videos for "Smooth Criminal" and "You Rock My World", Jackson pays tribute to the Fred Astaire film in his dance sequence in the 1930s or 1940s style lounge as in the Astaire film where the bar fight takes place. Dancers can be seen doing similar moves as female dancers wear similar designed outfits in Jackson's videos. Jackson wears a white suit with a blue collar shirt underneath and a white hat with a black stripe on it paying tribute to what Astaire was wearing in The Band Wagon's finale in Smooth Criminal. For You Rock My World, he imitates Astaire's choreography and confidence. "Billie Jean's" music video also features similar elements as those of the same number: The storefront scenery through which the paparazzo conducts his manhunt and the animal print cloth he finds for a clue are two very distinct allusions. Using the line "she came at me in sections" for the titular song of his album Dangerous, Jackson notably pays homage to the film on at least three successive albums. Steve Martin and Gilda Radner perform a seriocomic parody homage to the "dancing in the dark" dance segment on an episode of Saturday Night Live, originally broadcast on April 22, 1978.